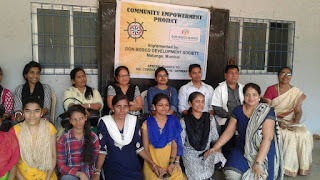 10-Feb-2018, Mumbai: The Don Bosco Development Society (DBDS) organized a cancer awareness and detection camp for the women residing in the slums of Ganesh Nagar in Mumbai. More than 100 women were examined in this health camp. This health camp was held under the aegis of project supported by Don Bosco Mondo, Germany. This Cancer screening camp was organized in association with Indian Cancer Society. Ms. Surekha Pednekar (Project Officer - DBDS) and Ms. Ranjana Gangurde (Staff-DBDS) inaugurated the camp. The camp was held in the premises of Ganesh Vidhyalaya School. Ms. Surekha welcomed and thanked Mr. Ashok Chavan, Mr. Anuj, Dr. S. P. Rao and their team for their support to this camp. Most of the women beneficiaries of this camp were from poor families who would have otherwise never gone to the hospital for examination. All women were screened for ENT cancer (including indirect laparoscopy) and comprehensive Gynaecological examination with Pap-smear test by specialized team of doctors and paramedical staff. All the tests and services were provided free of cost.